Happy new year everyone, 2010 sure did go fast. A history of the Stubby? Just curious, are you aware of any published works that deal with the history of the stubby in Canada and its iconic image to many of us? Re: A history of the Stubby? In response to post #2 ..... Brew North - "How Canadians Made Beer and Beer Made Canada" by Ian Coutts is a book on the history of beer in Canada and has some information on the stubby beer bottle. Presently I am updating the story of Eugene O'Keeffe who emigrated to Toronto in 1832. Just wondering if the O'Keefe brand of beer is still marketed. I have 2 bottles of the brand in my house since my visit to Toronto in 1994, and it started my research after I had seen the O'Keefe Centre for Performing arts. Did not know of the man before then. I have 4 (never opened)"Uncle Ben's" stubbies with the "first ever" pull tab tops. Any offers? I used to collect caps and labels from way back. I looked at your stubbies collection and was curious to know if your selling or looking to add to your collection. I have unfortunately lost most of my collection, but still have a couple hundred caps from the breweries pre capped. I am interested in adding to my collection and perhaps trading as well if you are interested in adding to yours. I do not collect bottles, or any sorts of breweriana anymore. My collection is presently stored away and I am not looking to add bottles or sell them, but I might start to buy stubbies in the future. Two full stubby bottles I'm interested in are Magnum Ale and Magnum 5.5 as a set. help with a stubby label? Hi, your site intro'd me to stubbies. Thanks. 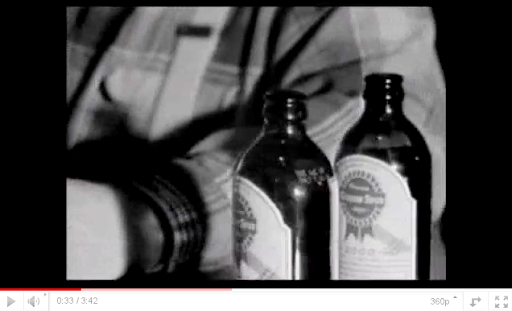 I'm trying to learn the name of the beer at around 33 seconds in this video by the Weakerthans. Any help emailed to me appreciated. Cheers. Re: Help with a stubby label? Sorry, I don't recognize the bottle at all. Below is a screen shot from the YouTube video. If I find more information on the bottle I will post it. I have several "stubby" bottles. However every image I can find online of a stubby has a small neck before the lip where the cap sits. The bottles I have, have NO neck at all. Just a lip where the cap sits. One is a Molson Export. I am trying to find any information on age and or value for this type of bottle. Any information to help point me in the right direction would be helpful. Thanks!! My husband was on a job cleaning out an old machine shop. He found 34 empty stubby bottles with a variety of labels. Do you know where in the Edmonton area we could sell them? The bottle depot would only offer 10 cents a bottle because they are under 1 litre. The person would have to come to us to pick them up. Thank you for any help you can offer. The best place to sell them is Ebay. You can check the completed auctions for a rough estimate on what you might be able to sell them for. Would EBay also be a good place to sell an entire collection? I have about 300 empty bottles, probably 200 of them stubbies dating back to the 60s and 70s, largely from Quebec and Ontario. No space for them anymore, but they do carry a degree of sentimentality. Yes ..... Ebay would be the best place to sell the stubbies. If you do a search for completed auctions you will get a rough idea how much they sell for. To speed it up you could even sell in lots of 10 and the empties would be easy to ship. I know what you mean by them having some sentimental value. My pre-digital camera equipment, 1970's stereo, LP's and CD's also had sentimental value but once you start selling and getting rid of them you wont regret it.